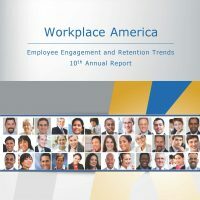 The 14th annual Workplace America report of employee engagement and retention trends, the longest continuously running study of engagement and retention in the US. Over 630 organizations participated for 2018, with 43% employing over 1,000 employees. This report summarizes key findings on trends and tactics organizations are using with success to increase employee engagement. Employee engagement is gaining respect as a key strategy for many organizations. This year’s report begins with good news as employee engagement continues to be respected as a key strategy for many organizations. For five years running, over 77% of US employers rank employee engagement as a strategic priority. Yet, that respect is not universally translated into dollars with only 54% of organizations budgeting for engagement efforts. Lack of budget support could be tied to the failure of many organizations to determine the cost of replacing a well performing employee, which only 25% have done. Four strategies for 2018 which will boost engagement and reduce unwanted turnover!